Our friends at the National Music Museum have been in the news in the past few days. The Washington Post had this article about their collection, and the fundraising effort that will play a large role in the Schwartz/Silver designed expansion of the museum. The Museum is something of a hidden gem, with probably the world’s largest and best collection of musical instruments, and we at Schwartz/Silver Architects, are pleased to be involved with the design of the new 65,000 sq ft museum complex. 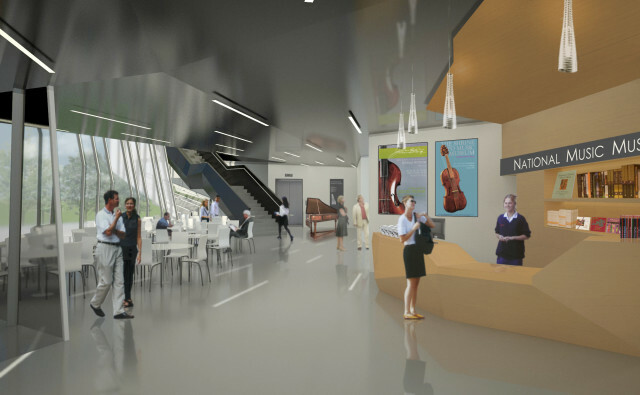 The expansion will include a new entrance plaza, rotating exhibits, a cafe, expanded gallery spaces for the permanent collection and a planned music performance hall (as part of a planned second phase). For a sneak preview of the design, check out ArchDaily’s article .